Look to the skyline and see the cranes towering and swinging back and forth as if speaking to each other as they pass. They arrive in pairs or small groups, some are solitary. Who summoned them? Is there a plan? When they disappear from the skyline, what will they leave behind? Will we remember what was there before? Cranes in Japanese lore are long-legged, long-necked, mystical creatures who live for a thousand years. Legend promises to anyone who folds a thousand origami cranes, one for each year, a wish granted by a crane. What does Toronto, with its thousand swinging cranes, wish for? 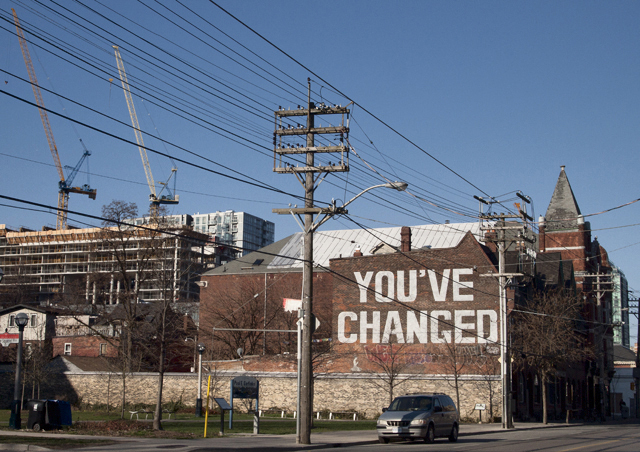 Our city is changing. It is transforming before our eyes. The cranes remind us of this every day. We want to talk about it – about the big city issues and the little neighbourhood things – the things that make a city, that give it longevity and immortality. A recent historical perspective by a former city planner and documentary photographer. 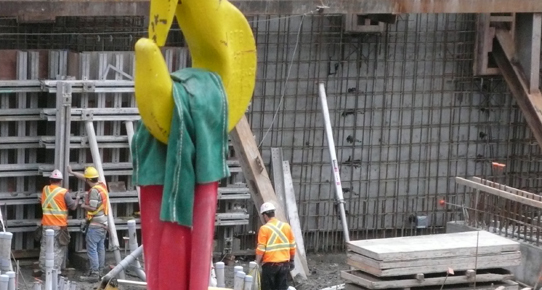 Photo essay of construction workers below grade at Yonge St. north of Dundas. The Demise of a Local Landmark. Can planner Jennifer Keesmaat make a difference? A nesting project in the St. Clair West area. Living in a highrise condo. Snippets of the conversations going on about the city. A photo essay from all around the city. Cranes wherever you look. Websites and articles relevant and related to this issue. Now that I travel the Go train in from Richmond Hill I’ve been fascinated by the cranes as we approach the city through the green forest of the Don Valley. I’ve watched over 5 years as the once interesting area around the distillery district be turned into a tourist ghetto as it’s surrounded by those monstrous, glass towers. There was so much possible with repurposing the old warehouses and factories in the district – Chicago has done such interesting things with their old industrial buildings. But now its gone and you’d never know it was even there. Thanks so much for sending me this amazing collaboration of photos, history, stories, and visions for your city. I was captivated and felt like I got to know people and neighbourhoods from a city I do not live in. Imagine the impact for those who do live in Toronto. I think this is a wonderful and innovative way to connect communities. 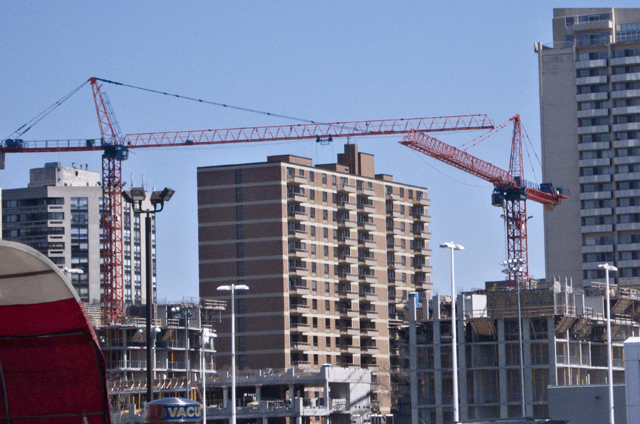 It is interesting to me that I have had many thoughts of the number of cranes around Vancouver, the never ending construction and parts of my community in North Van hardly recognizable with all the density of the never ending Condos. You may have heard this week, that Donald Trump hit town to announce the building of a 63 story Trump Tower on Georgia street. Enough to make me choke. I think your online journal is going to be very successful. 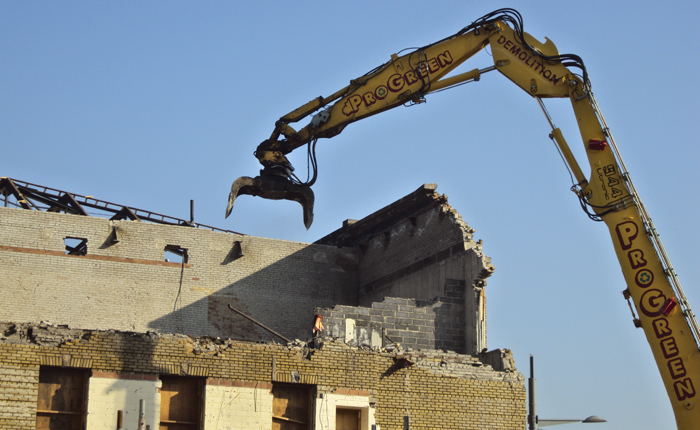 There are so many stories around landmark buildings that just get demolished. Perhaps we would all have a greater respect for preservation when these buildings get personalized around photos and family stories.